There may be a fine line between love and hate, but at least it is visible and you know when you’ve crossed it, I think. What I am finding is that the line that defines the end of just irritating and the beginning of completely infuriating is often blurred, hidden, invisible altogether. So, I wonder how it is that our boundaries are so ill-defined when the outcome of crossing them can be so dire? What has happened here is not all that poetic. My morning reverie was shot through and through with practical worrying about keeping the rain off me while I run out to catch the bus. I would much rather be the guy who says, “Let me hit the snooze button and just listen to the rain.” But instead, I got up right away to assess the damage. It was only when I checked the weather report and found that the rain was supposed to stop at noon that I was able to relax and think about breakfast. Isn’t it the same with a lot of other common sights and sounds? The sound of a child laughing is charming. But the sound of a grownup laughing has an internal clock that starts to tick for me. Chuckle and it’s fine. Keep it up though and I will move to the other end of the bus. The sound of a car alarm doesn’t even cross over into my consciousness when I hear it the first time. But keep it up and I think about calling the police. There are all kinds of things that we can tune out, turn off, not react to, as long as it doesn’t continue. But then there is that line, the one I don’t see, that when I have gone past it, I know I need to be more aware rather than less. C.S. Lewis wrote in The Screwtape Letters that humans can endure practically anything as long as they know it’s not going to last. Maybe that’s the key. Maybe it’s just my inability to make simple irritations stop that makes their continuing all that irritating. It’s more about a loss of control of the environment. I can’t turn off the car alarm. There is a woman now who is on trial for stabbing her husband to death. She says, on that day, she was going to kill herself with a very large knife, but when her husband confronted her, she turned it on him in the heat of the moment and he died. How was it she lacked the simple inner strength to walk away? How will the jury ever know for certain that she wouldn’t react this way again? Will she see that line in the future or will she cross it again and not be able to stop herself? Her violent reaction to not being able to control her environment, her life, or the outcome of this one conversation caused his death. They say that familiar music is the most calming to listen to because for only a few moments, you can, in some small way, predict the future. When you hear a song that you know, that you can sing, you know how it goes and you know how it ends. You know there’s a second verse or a section where the piano does something. It’s that very predictability that calms you. You know the outcome, and, especially if you don’t enjoy the song, at least you know it’s going to stop. So I am working on this. Put simply, I want to have minor irritations not bother me so much. C.S. Lewis would probably say that’s a good idea. 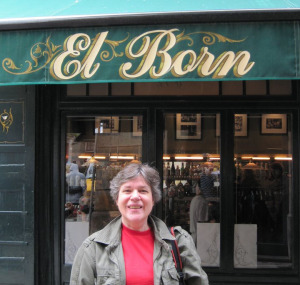 PHOTOGRAPH: Anne Borne in her very own personal district of Barcelona, Spain (2009). NOTE FROM THE AUTHOR: My name is too short. I always wanted something lingering, graceful. It was only when Ian Fleming’s stories took hold that I realized my name sounded like a spy. Born, Anne Born. I don’t care for Martinis, but if I did, I would like them shaken, not stirred.